In my last post, I tackled Fudge’s prooftext of Romans 2 and how the chapter itself did not mention conscious torment or “unending tortures.” While the text does not explicitly mention those things, Romans 2 does implicitly reference conscious torment---with its use of the words “tribulation and distress.” There are two other words the chapter uses to discuss the end---“wrath and indignation.” It seems that, contra Fudge, the text is not as silent on the subject as annihilationists would like to have us believe. “Such generosity of spirit (towards those who disagree) flows more naturally when we rank our issues the way Jesus and the New Testament writers weigh them---in proportion to their relationship to the gospel. That means, as Randy Harris explains, that we ‘imagine concentric circles with the cross at the middle’ so that ‘conversations at the center carry a great deal more weight than conversations in one of the outer circles.’ Assessing an issue’s relationship to what is most central---the gospel itself---puts it in biblical perspective” (Edward William Fudge, “Crediting Others With Good Faith,” from The Fire That Consumes: A Biblical and Historical Study of the Doctrine of Final Punishment, Third Edition. Eugene: Cascade Books, 2011). 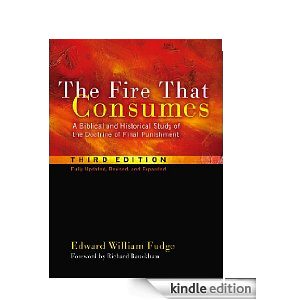 For Fudge, the issue of the nature of hell (not to mention the doctrine of hell) constitutes an issue that is located in the “concentric circles” that extend beyond the middle, which contains the cross. Thus, the salvation of humanity is more important than a biblical discussion of hell. Hell is secondary when compared to the cross. “For God so loved the world, that He gave His only begotten Son, that whoever believes in Him shall not perish, but have eternal life. For God did not send His Son into the world to judge the world, but that the world might be saved through Him. He who believes in Him is not judged; he who does not believe has been judged already, because he has not believed in the name of the only begotten Son of God” (John 3:16-18, NASB). Notice that in John 3:16-18 above, Jesus talks of “judgment” or “condemnation” (King James, New King James translations) twice? This should dispel the notion that condemnation has nothing to do with the gospel. If the gospel involves salvation, and condemnation (or hell) is the exact opposite of salvation, is condemnation not a part of the message of the gospel? If condemnation is not part of the gospel, I don’t see why we would warn men and women that the wages of sin is death (Rom. 6:23). I don’t particularly see the reason for Paul’s statement that “Knowing the fear of the Lord, we persuade men” (2 Cor. 5:11) if condemnation is not part of the gospel. If condemnation is part of the gospel, and the gospel (the cross) is at the center of evangelical discussion, does this not place hell in the middle of the “issues diagram,” where the cross is, with the other issues being placed in concentric circles? I think it is here that we see that Fudge’s attempt to show Christian courtesy and unite evangelicals around salvation is nothing more than a “Let’s be cordial and agree on the essentials,” forgetting that hell, being a part of the gospel message, is, in and of itself, an essential as well.